The dream of a simpler way of life lead us to the remote mountains of east Tennessee. With the purchase of a 100-year-old neglected property which we lovingly restored, Free Reign Farm was born. Our family is firmly rooted in Christ and we strive to give Him Free Reign over our lives. Our commitment to family and a natural lifestyle lead to the birth of our business. 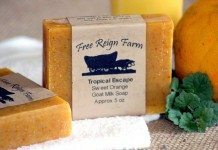 Free Reign Farm is not only a working farm, but produces an outstanding line of all natural skin care products. Originally developed for our own family use, we are excited to share our hand-crafted treasures with you! Free Reign Farm is 100% family owned and operated. A commitment to Christian principles and natural living ensures a high standard of stewardship in our business. Our goats thrive on lush mountain pastures; we raise chemical free herbs, and use sustainably harvested, non-FMO oils that don’t damage the environment. We hope you enjoy your little piece of the farm life with our natural, handcrafted products!